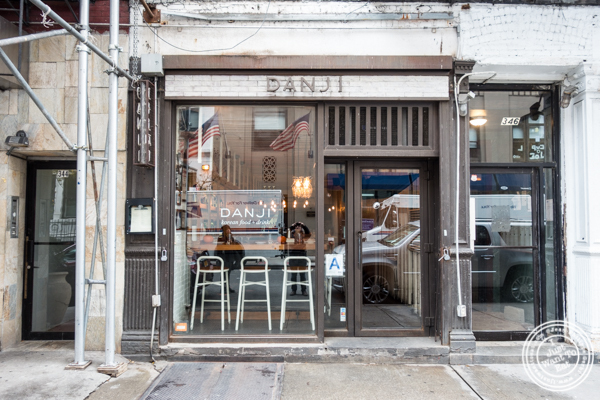 After meeting Chef Hooni Kim at a cooking class (DeGustibus event at Macy's), and a great dinner at Hanjan, his restaurant near the Flatiron, Jodi, Malini (aka The Restaurant Fairy) and I decided to go for lunch at Danji. Why lunch? Less crowded and good light. The reservation was at the time they opened so I admit that I was glad to be able to take few photos before patrons arrive. Similar to Hanjan, this place has a zen feel, thanks to the light wood they use all over, but with still a modern lookl given by the chandeliers and the high tables, either communal or for large parties, next to the bar. As a fun fact, each table has a drawer where you can find the menu. Tofu with ginger and scallion dressing (fried): this is not your classic tofu dish and is different from the one at Hanjan that is terrific. Here, the tofu is like wrapped into mochi before being fried, giving an incredible texture to the whole thing, the outside being a bit chewy and the inside quite soft. I should mention that both restaurants are making their own tofu. Mandoo tacos filled with bulgogi: this is a great way to bridge Korean and Mexican cuisine. Mandoo is a Korean dumpling, but there, they opened the shell in the shape of a taco. This was delicious, crunchy, with the bulgogi delightfully coming through. Chul-sot spicy pork belly bibimbap: you will not find this exact name on the menu. Rather spicy pork belly bibim-bap, the chum-sot bib-bap being an option so the dish comes very hot, creating a crunchy layer of rice in the bottom (that crust is called a socarrat, similar to the one in paella). This was fantastic: the entire bottom of the pan was this thick rice crust that was deliciously crunchy. We mixed up all the ingredients on top of it, including the egg, and ate it in probably less time than it took to cook it as it was so good. But not spicy as I expected. This was a very good lunch, different from the classic Korean cuisine I usually find. Chef Hooni Kim really succeeds in creating a unique experience in his restaurants and, once you go, you want to come back. So yes, I will go back to Danji, for dinner this time, and not only to get these crispy rice cakes, trust me!